We have spent quite a bit of time in the desert. Most of our friends think we're nuts: "But there's nothing there!" We hear that a lot. I think you have to get into a certain mindset to enjoy it. Back up, take a different view of your surroundings, and you will be surprised by how much is going on right under your feet. On a broad scale, the mountains and valleys are in plain view, the earth building up the mountains just to have the weather tear it down right in front of your eyes. I think that's cool. 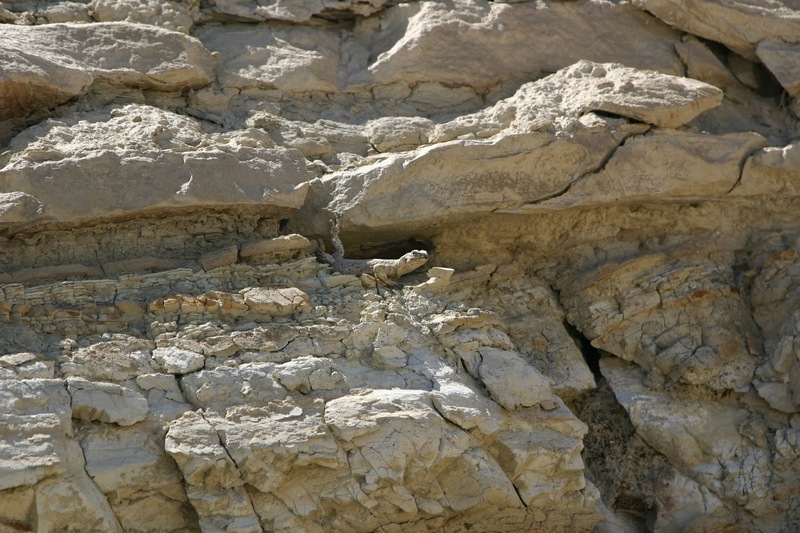 The weather is just one of the difficulties the smaller desert dwellers face. There are mountain lions, coyotes, hawks, owls, ravens, egrets and herons (near the few water sources) all looking for a meal. The little reptiles and rodents have come up with some pretty clever ways to stay alive, some of which would be the envy of anyone who shops at Cabela's. Ring-necked Lizard, doing his best to blend in. Mark is a fiend for reptiles. 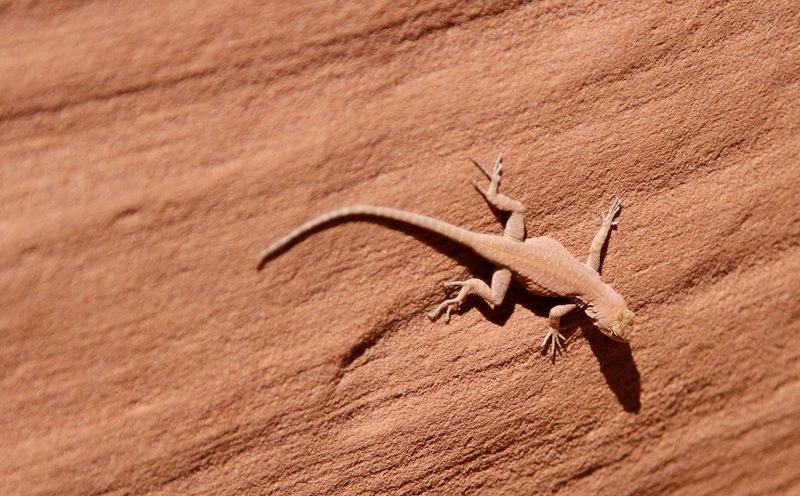 While I'm off looking at the plant life, he's running through the desert in pursuit of the ring-necked lizard he's been dying to get a picture of. 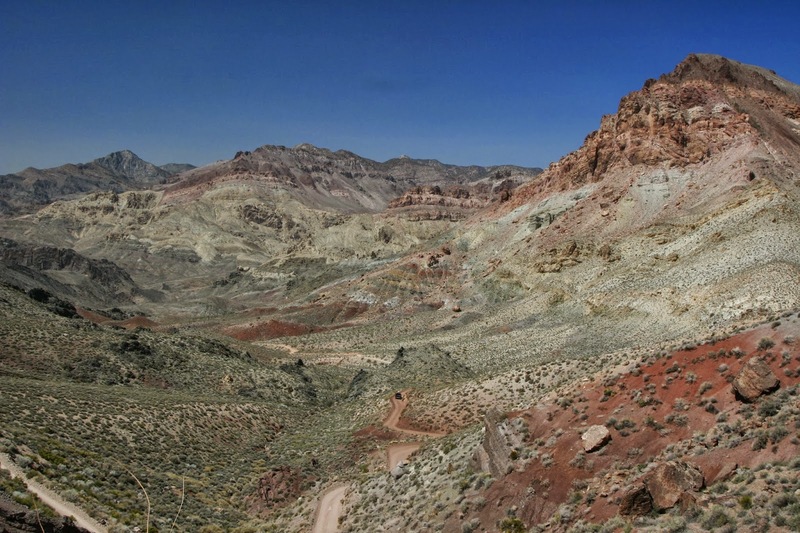 On more than one occasion I've lost him on a trail as he races off, yelling over his shoulder "Chuckwalla! 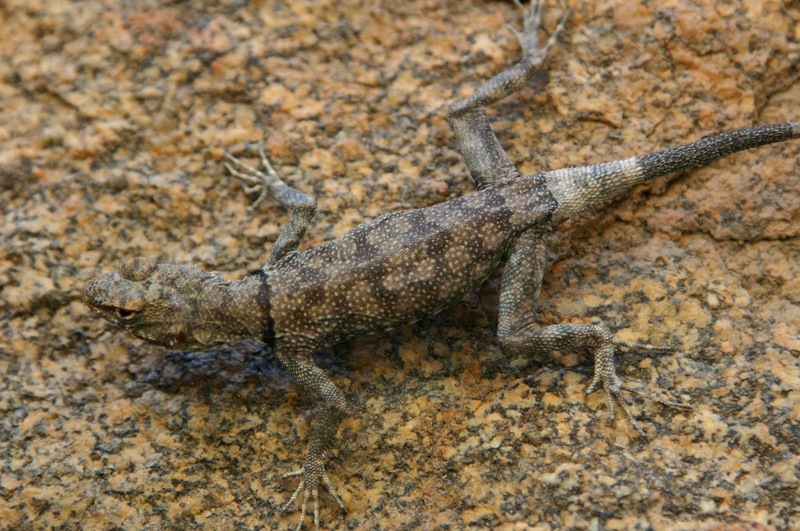 Chuckwalla!" 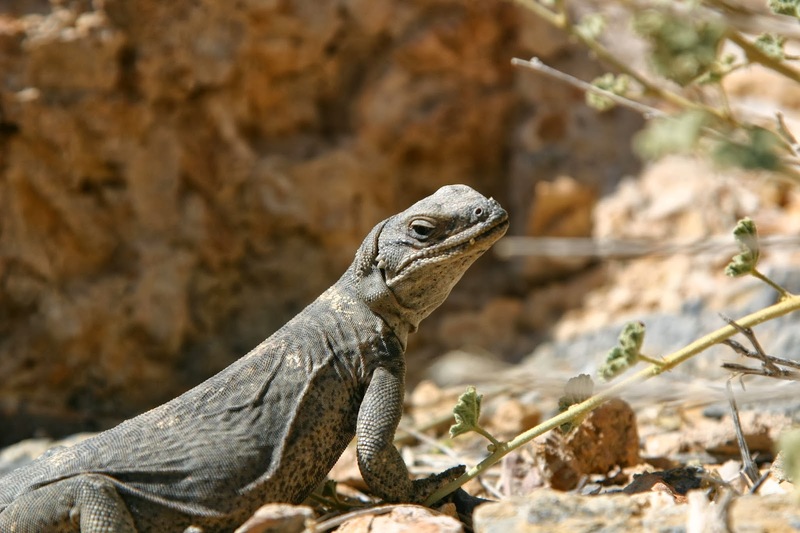 The holy grail of Mark's world, the chuckwalla is a huge reptile that also happens to be very shy. When it feels threatened, it runs into a crevice in a rocky outcropping and inflates it's lungs, fending off all efforts to pry it out. We've been lucky enough to spot a few over the years, and they are a pretty amazing sight. I'm glad they're shy; they remind me of a dry version of a Komodo Dragon. They just look fierce. Chuckwalla, posing for the telephoto lens. Chuckwalla at home. This guy was probably two feet long, not counting his tail. The Whipsnake that started my NBA aspirations. 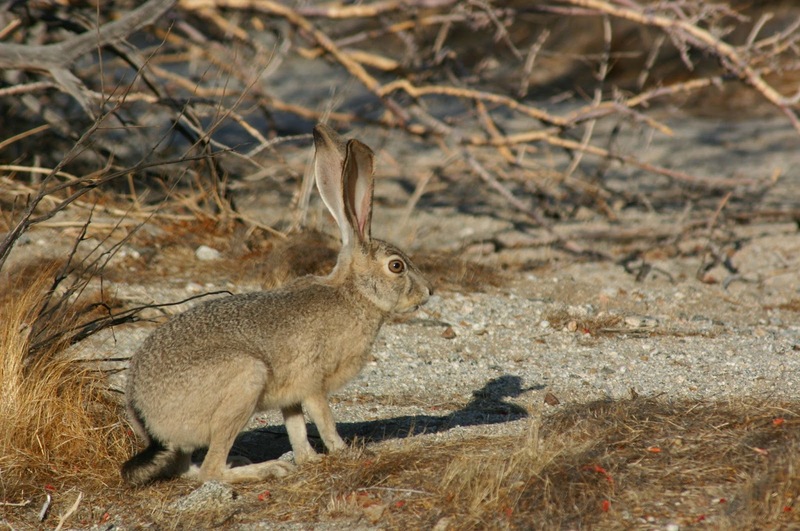 Jackrabbit in New Mexico, outside Carlsbad Caverns. 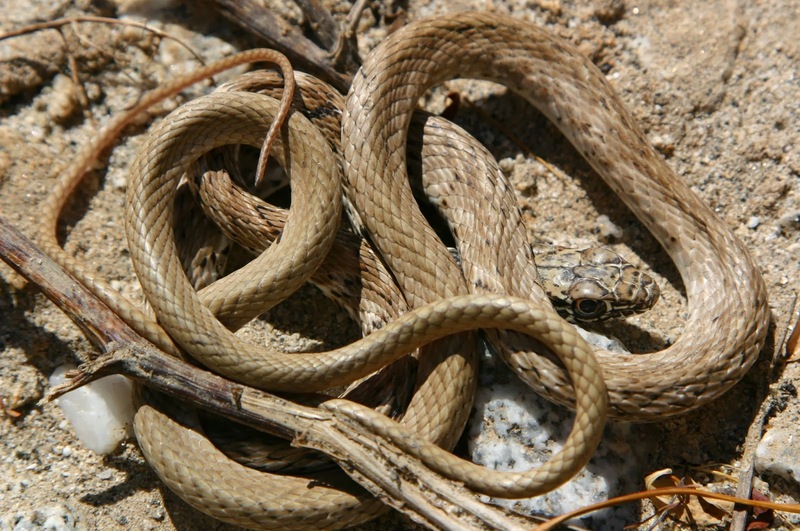 Notice how the coloring changes, depending on the surrounding vegetation. 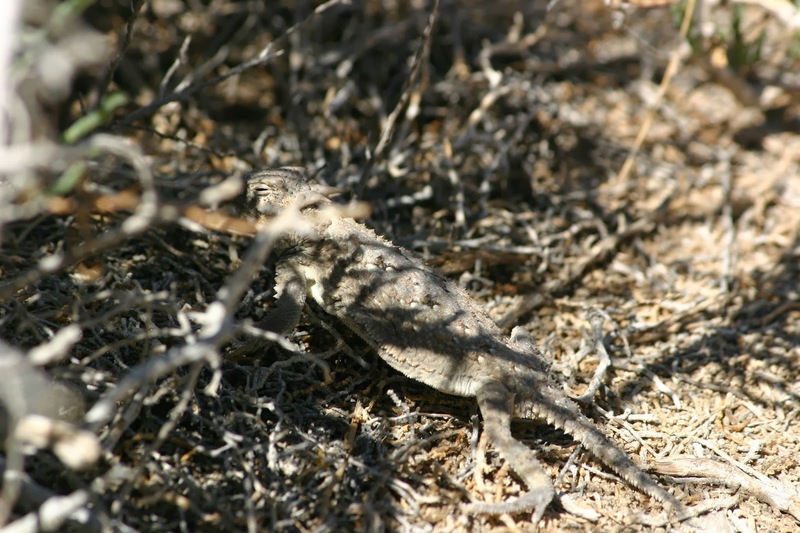 One of my greatest regrets is accidentally running over a Horned Lizard (sometimes called a Horny Toad, although it's not a toad at all.) I was driving back to camp when it crawled out onto the road in front of us. I swerved to a point where I thought it would go between the tires but I didn't calculate it out quite right and the most sickening squelching, splattering sound could be heard in the back fender. 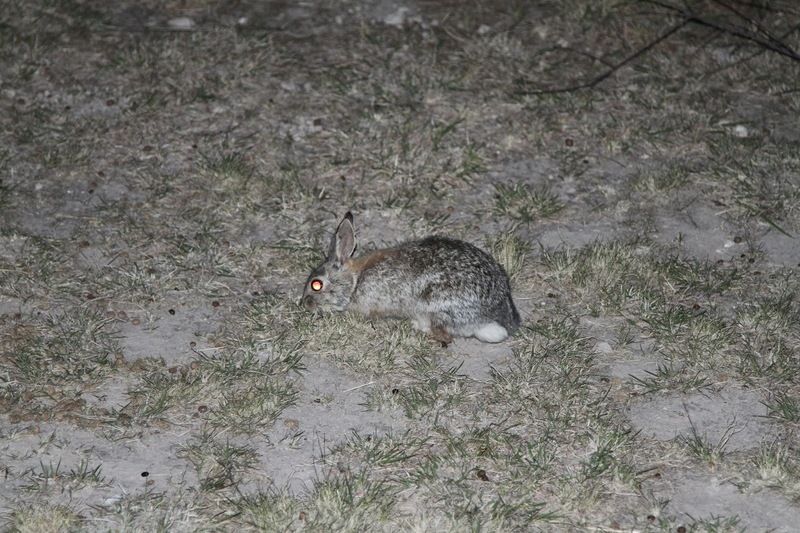 To this day I feel bad; they're not endangered, but they are a pretty rare sight. To make things worse, we had just come off a side road where we had spent a good twenty minutes taking photos of (very possibly) this same lizard. It's no wonder this guy was trying to hide from us. Oh, the humanity! 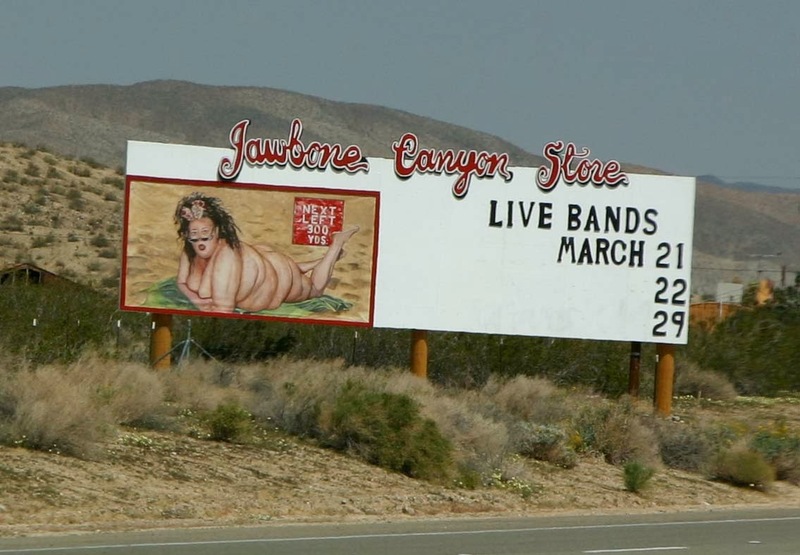 Of course, there are always the things in the desert you'd rather not see. I think a little camouflage now and then is a good thing.